Do you think your home’s air is safe to breathe? If so, then listen to this carefully: Top five. That is where the Environmental Protection Agency ranks indoor air pollution on its environmental dangers list. As it turns out, your indoor air is filled with harmful contaminants that are pecking away at your home’s wellbeing. Even worse, your home is taking your health down with it. So, before your peace of mind crashes, hand the wheel over to Swanton Energy Services. As your pilot, we’ll steer your home toward the fresh, clean air you deserve with an air purifier. This device is designed to remove pollutants, bacteria, viruses, mold and algae from your indoor environment’s radar—for good. Looking at something from a bird’s eye view means getting a broader picture. But that’s not the case with Swanton. When you take a gander at your home through our team’s eyes, you’ll see your indoor environment’s true wellbeing. The worst part? You’re the one who brought them onboard. You see, all household cleaning products, adhesives, disinfectant sprays, deodorizers, insecticides, paints and stains that you use emit harmful pollutants into the air. Once inside, these dangerous contaminants refuse to leave. Before you know it, they’re ruling your roost. You’ve lost control of your indoor environment’s wellbeing. You’ve seen the truth for yourself. Now, it’s time to clear the air—literally—with an air purifier from Swanton. This device is designed to make harmful pollutants and airborne intruders fly the coop, landing air that you can count on to be healthy and clean. To get your IAQ back on course, our air purifiers will pull in your space’s contaminated air, effectively remove any harmful particles or pollutants it detects and then release the spotless air back into your home—guaranteed. In fact, time and time again, our air purifiers have proven to effectively remove 99 percent or more of harmful particles from our customers’ air. This includes pet dander, dust, dirt and other similar contaminants. Take off toward perpetual breaths of first-class air by filling out our online form or calling us at 732-335-6731 today! 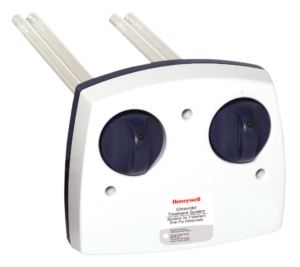 Attain a cleaner and healthier indoor environment in a flash with Honeywell’s Ultraviolet (UV) Air Treatment Systems. Using a UV lamp, this apparatus zaps 99.9 percent of mold spores in your home and kills up to 87 percent of certain airborne bacteria in the air passing through your HVAC system. This prevents them from recirculating into your home and the air your family breathes.